This translucent model provides a detailed, three-dimensional view of cell. The realistic representation of a plant cell is enlarged approximately 4000 times and includes the nuclear membrane, cell wall, chromosomes, endoplasmic reticulum, chloroplast, large central vacuole, mitochondria, and ribosomes. The model shows 25 organelles and inclusions, and the detailed cell wall shows the relationship to adjacent cells. 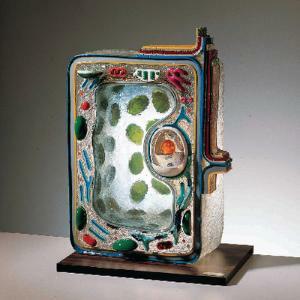 Made of translucent fiberglass-reinforced plastic simulating real cytoplasm, this one-piece model is mounted on a base. Ordering information: The model includes a key identifying 24 structures.